It's an exciting way to catch walleyes through the ice and can be done as a single tactic or in addition to setting tip-ups. In Wisconsin, we are legally allowed to fish with three lines. I can drill and set two tip-ups and have a third option reserved for my walleye ice jigging rod. You can trigger strikes during the daylight hours when nothing else works. But, my favorite time is after dark with glow-in-the-dark lures. Rattle lures also will out-fish all other tactics after dark. Even lures like a Cicada which offers strong vibration when jigged upward can increase the amount of walleye strikes on any given night. The spinning rod and reel combo used for ice jigging is nothing like summer fishing equipment. Choose short 24- to 30-inch rods with a medium to heavy action size. Be sure to select ones with large eyelets as ice build-up is common. The ultralight reel should fit comfortably in your hand with gloves on. Good examples are models like the Tiny 20 ultralight reel, Shakespears 2500 ULX or Shimanos TX500. Spool up with #6 Stren Magnathin, #6 Berkley Cold Weather or #10 Berkley Fireline, which is my favorite. Always ask your favorite sport shop sales person for their recommendations as they know what working. Remember to set your drag. It should be lose enough to slip when you set the hook. All fishing lines break easily under cold conditions. Also, keep the line guides free from ice buildup whenever possible. Sharp ice will cut a line when the hook is set. There are always several good "go to" lures and many that aren't. The old standbys like the size #3 and #4 Swedish Pimples, #3, #4 and #5 Jigging Rapalas will catch their share of nice walleyes. But with the growing interest in this method several new exciting choices are now available. They include the #2 and #3 Nils Master Jigging Series, Lindy's Rattl'n Spoon and Northland Tackle Buck Shot Rattler in the 1/8 and 1/4 oz. sizes. Perch patterns, silver shiner, firetiger, and glow color patterns are very popular choices. Use #0 and #1 Split Rings on all your lures and spoons to enhance the swimming action. When strikes are few and far between, try tipping the spoons with the head of a fathead minnow or Milwaukee shiner. This can trigger immediate strikes. Even when I leave my tip-ups behind, I still bring along a couple dozen fatheads or shiners for tipping purposes. Also, a couple waxies on the treble hooks of either the jigging lures or spoons can be dynamite. Try ice jigging for walleyes in the same productive areas that tip-ups work. Weed beds, rock bars and deep mud flats are a few popular areas. I start out jigging in the green weed beds in the 8- to 12-foot range. The early-ice green weeds will still attract baitfish and predator fish to that area. Winter walleye schools quickly come and go, as we all know, but if a walleye swims into my jigging area- I will most likely catch it. Drill several holes prior to setting your tip-ups and jigging. By doing this you will be less likely to spook a walleye or school of walleyes that move into your area. Never drill or chop holes during the key fishing hours of dusk or after dark. Move often from hole to hole because any hole can yield up to two quick fish. It's rare to catch more than 2 walleyes at a time as they quickly spook. But coming back to that same active hole after a short break is a smart and productive move. I can't tell you how many times I've looked down into the ice-hole only to see several nice walleyes. I often would rush to place a tip-up there with a tasty looking shinner without success. Had I known more about this ice jigging method back then, I would have had instant strikes. Just remember LPS location and presentation equal success! Ever sit on your bucket right next to an ice fisherman that is catching one fish after another, and you can't buy a bite? It's happened to us all. Those ice anglers that seem to always be successful at "ice jigging for walleyes" really have perfected the lure presentation and technique. I'll give you an example that I think says it all. I spotted a #3 lb walleye directly under my hole on Minocqua Lake as I was jigging my #3 perch pattern Rapala. The fish would not strike that lure no matter how I jigged it. Finally, I set the rod down across my pail after several minutes and, you guessed it, BANG. Who knows what jigging method will work on any given day? But, one thing is for sure and that is it's important to mix it up. Drop your lure to the bottom. Never hold the line in your finger-unless of course you don't need that finger anymore. Close the bail and firmly hold the rod in your hand. Start out by moderately snap jigging the spoons or lures upward. Always hold tension on those lures as they free-fall back down. Stop the lure about one foot off the bottom and hold it there very still! Holding a (2- to 3-second) pause is best before repeating your jigging. Occasionally tapping or lightly touching these lures on the lake bottom is a good way to provoke negative walleyes into striking. But remember, most walleyes strike the bait offering when it's level or slightly upward. 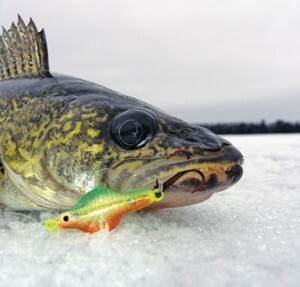 Many active walleyes are turned off, by the ice angler holding the spoon too close to the bottom. Keep repeating the method for up to 5 minutes per hole. Don't get lazy. It's important to keep moving and searching the various holes for active fish. The best presentations are obviously those that work but you must also find the active walleyes. It's amazing how quickly you can "Fine Tune" this technique. Each individual lure has its own special shake, wobble, sound and darting action. Experimentation is the neat thing about this method. It is a challenge. I'm always learning more every time out on the ice. Give Jigging For Winter Walleyes a try next time you hit the ice. It's exciting, productive and should not be overlooked! Drill allot of holes, move often and you'll be hooked too!